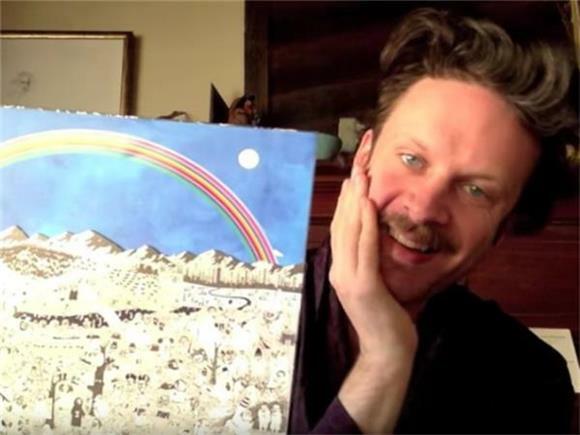 Good news: there is now a hilarious homemade video of Father John Misty in a robe, unboxing the deluxe vinyl edition of his new album, Pure Comedy, and it is guaranteed to brighten up your day. Set to a cheerful instrumental, Josh Tillman calmly unravels the record, which first starts out looking like the original cover but soon turns into a whole new world of possibilities: a warm orange sky, a scary dark red night, a joyous rainbow, and more, all leading up to the big reveal of the vinyl itself. Two versions. He's got two versions! (Aaaand cue Frank Ocean). This is embarrassing to admit as a music journalist, but I don't own a record player. A record player by itself is big and it requires a table to sit on, plus the five barrels of vinyl I would have. I strongly dislike clutter so much, that there was one time when I almost considered switching to a twin sized bed just to save space. That's insane! No one likes twin sized beds... Where was I going with this? Oh, right. So I don't own a record player, but this is definitely making me want to take the plunge; it looks too good. Father John Misty, you just might make me face one of my greatest fears.